Make a quick and easy meal on a weeknight that is dinner-party worthy. Start with leftover cooked chicken or pick up a pre-cooked rotisserie chicken from the grocery and add mushrooms, sweet onions, cream cheese and herbs. Frozen puff pastry wraps it all up for an eye-pleasing and tasty presentation. Let the puff pastry thaw while you make the filling. Melt the butter in a heavy skillet over medium heat. Add sweet onions, mushrooms, garlic, and salt and pepper to taste. Saute until the onions are translucent and the mushroom liquid has evaporated. Stir in the parsley and set aside to cool to room temperature. Mix the cream cheese, Dijon mustard, thyme, and sage until combined. Set aside. Roll out the thawed puff pastry on a lightly floured surface into a 14-inch square. (Rolling between two sheets of plastic wrap makes easy work of this task.) Cut the square into 4 equal 7-inch squares. Divide the cream cheese mixture equally among the squares, then top with the mushroom mixture and chilled chicken chunks or strips. Brush the edges of the puff pastry squares with egg wash.
Bring the corners of each pastry square to the center, sealing all edges to contain the filling. 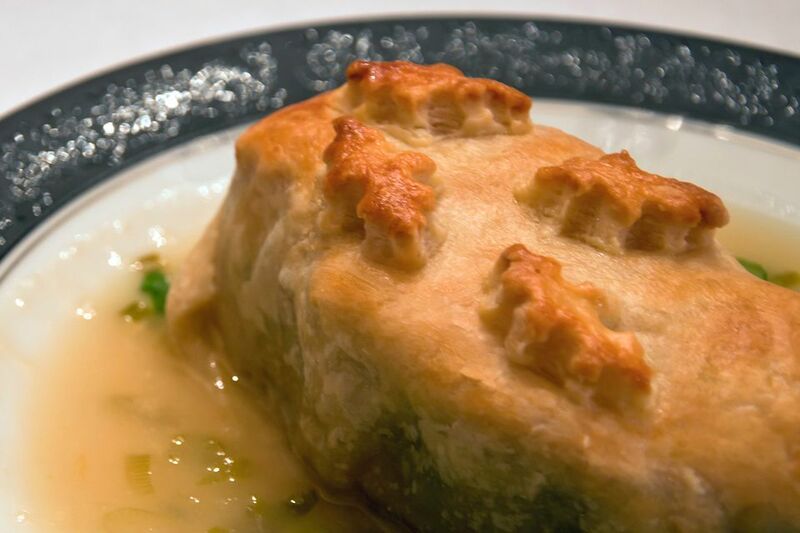 Place the pastry squares seam-side down on an ungreased baking sheet and brush with egg wash.
Bake the chicken Wellington bundles for 25 minutes or until golden brown. Do not use raw chicken for this recipe. There is not enough time to thoroughly cook the chicken. Be sure the cooked chicken is chilled. Serve with steamed broccoli, peas or green beans and warmed French bread. Pair with a dry white wine like chardonnay, sauvignon blanc or pinot grigio for a fancied-up weekday meal.